With the threat of the Zika virus this year, the most important action you can take to keep you, your family and neighbors safe from mosquito-borne illnesses is to eliminate mosquito breeding areas. Mosquitoes breed quickly in standing water, so eliminating their breeding grounds from your property has a direct impact on reducing local mosquito populations. Try taking a quick trip around your property and make note of any places that hold standing water. You might be surprised by how many mosquito havens are hidden around your property. It only takes a bottle cap full of water to yield an entirely new generation of mosquitoes! Ewww! Keep gutters clean and pick up litter along your street, sidewalk and alley. For areas where standing water is difficult to remove, such as ponds or rain barrels, mosquito dunks are an effective way of killing mosquito larvae without harming other living things. Bti is a natural mosquito larvicide which, when used as directed, is harmless to people, birds, fish, pets and wildlife. Bti dunks are available at most hardware stores. While many people turn to spraying or fogging to mitigate mosquitoes, this practice is usually not safe or effective. Eliminating mosquito breeding areas is much more effective at controlling their populations. While fogging kills adult mosquitoes it comes in contact with, it does not kill eggs or larvae swimming around in your birdbath, which means the breeding cycle will continue once the fogging truck is gone. Plus, fogging kills all insects it comes into contact with, including butterflies, beneficial insects that prey on mosquitoes and other important pollinators. To opt out of fogging on your property, contact the Citizen Service Bureau (CSB) at (314) 622-4800 or www.stlouis-mo.gov/csb/. Special thanks to the City’s Health Department, Missouri Botanical Garden and the St. Louis Zoo for spearheading efforts to protect our community from mosquito-borne illnesses. The City’s Health Department launched a “Fight the Bite” campaign to distribute messaging across the City. 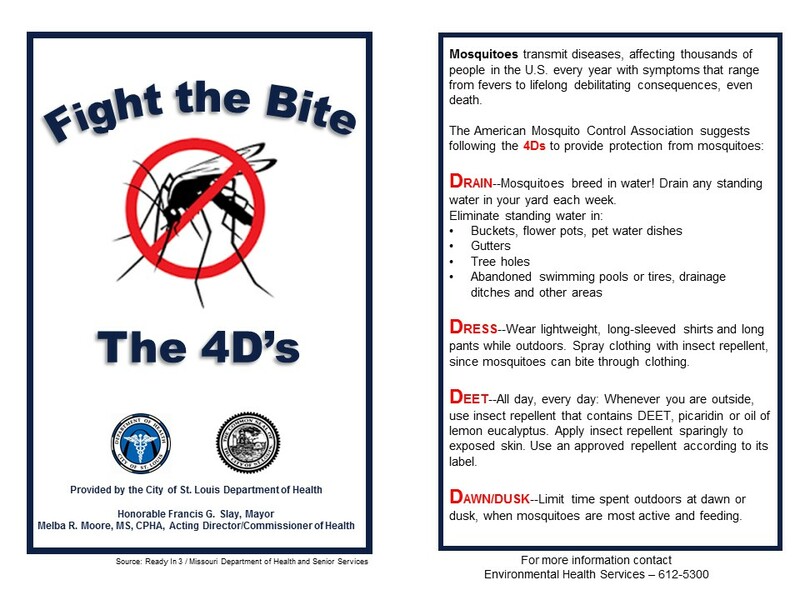 They recommend following the 4 D’s, which include Drain, Dress, DEET and Dusk/Dawn. And finally, one of the most influential people leading local efforts to reduce mosquito-borne illnesses while maintaining biodiversity is Jean Ponzi, Green Resources Manager of the Missouri Botanical Garden’s Earthways Center. Jean wrote a wonderful piece, published in the June issue of The Healthy Planet, which is well-worth the read.